After only a week online, we are ready to issue an update to this topic, thanks to further information from Dirk Anderson. 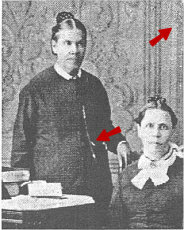 If Dirk's information is reliable, then we now know that the picture of Ellen White and her sister on Dirk's web site has been doctored twice, not once as we had previously assumed. On July 3, 2005, we sent the first of three enquiries to Dirk, asking for more information about where he had gotten that picture of Ellen and her sister Elizabeth from. From July 9 through August 6 we received back four replies, and the only answer we could get was that he had gotten it from the 2000 edition of Sydney Cleveland's book. Of course, as we have pointed out, that cannot possibly be true. We thus felt fairly comfortable posting our analysis on August 7, initially assuming that all the tampering with that picture had occurred after it had been scanned. However, that assumption was incorrect. When you asked, I assumed the picture in the copyright 2000 book was the same as the one in prior versions, but it is cropped slightly. I did get the picture from White-Washed, it was scanned in by myself. I don't know which exact version it appeared in uncropped because I gave away all of my older versions. Someone complained about the poor quality and graniness [sic.] of the picture, so we smoothed it out and increased the contrast. You're lying (what's new?) when you say it was doctored because no object was added or taken away from the picture. The 2000 edition of White-Washed does not contain a cropped version of a larger picture from an earlier edition. It is instead a copy of an already cropped picture (see below). 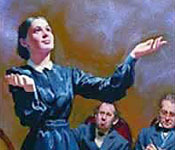 the pocket watch chain ends at a different place on Ellen White's dress than it did in the original. The picture Dirk claims to have innocently altered was in fact already altered by someone else. This suggests that Dirk never bothered to make sure that the picture he was copying was authentic. For how long did previous editions of Sydney Cleveland's book contain the bogus picture? Did Cleveland tamper with the picture himself, or did he copy yet someone else's picture without verifying its authenticity? Has Cleveland or his book's current publisher ever published an apology or retraction for distributing a bogus picture of Ellen White? Though the 2000 edition of Cleveland's book devotes 26 pages exclusively to the topic of plagiarism, it gives no hint that Cleveland got the replacement picture in question from a 1960 book entitled, The Spirit of Prophecy Treasure Chest. The Treasure Chest picture conclusively proves that the present picture in Cleveland's book is not a cropped version of his previous, doctored picture. Here are the entire pictures as found in the 2000 edition of Cleveland's book and in Treasure Chest. 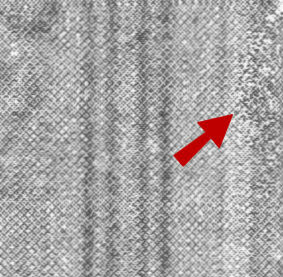 Not only do the bottoms of the pictures end at precisely the same point, but Cleveland's copy faithfully reproduces a defect in the picture from Treasure Chest, marked by the lower red arrow. Ellen White's supporters . . . will accuse you with deception rather than accept the photographic evidence placed in front of their eyes.—White-Washed, p. 203. Cleveland gives no hint whatsoever that Ellen White was wearing a pocket watch, not ornamental jewelry. He gives no evidence to support his claim that that chain was made of gold. 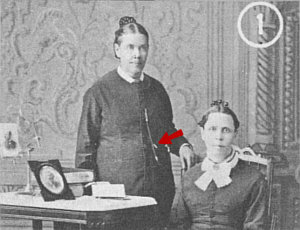 His previous picture showed a chain that went to Ellen White's side, when her watch was in her front pocket. His previous picture showed a chain lighter than her dress, when it was the same shade of gray as her dress in the original photograph. 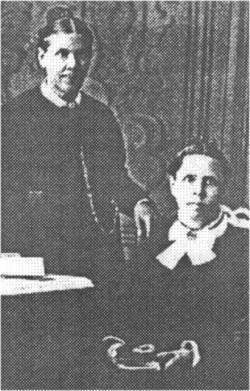 In this old picture the graininess remains in the dresses and faces, graininess which Dirk later removed. (Nothing wrong with that.) Thus it appears at present that Dirk did not draw the "gold chain" on the dress. Who did, whether Cleveland or an earlier critic from whom he got the picture found in his book, we do not presently have a clue. We are unprepared to say that every criticism against Ellen White is as unfounded as this one, but an apology and retraction is definitely in order for the use of this fraudulent picture.